The younger terraced member is well jointed and strongly bedded with clay-shale layers interposed between limestone beds at intervals, to produce the characteristic stepped profile of the hills. The upland areas in and around the National Park are underlain by rock belonging to this member. These include the high commons along with Mullaghmór and the hills of Slieverua and Knockanes which are outliers of the main Burren limestone plateau and mark the southeastern extremity of the Burren uplands. The underlying Maumcaha Member is bedded only in its uppermost part and also has silica (chert) rich zones in its topmost section. The low-lying areas in the park are underlain by this stratum. 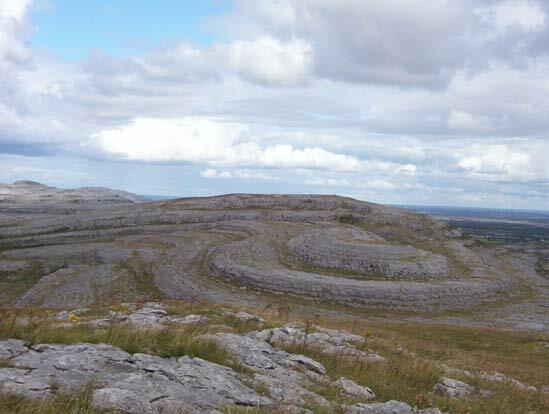 The area of the National Park is the only part of the Burren that has been subjected to any major tectonic disturbance. Elsewhere in the Burren, the limestone beds are flat except for a very slight tilting to the south-west. In the National Park, substantial folding of the rock may be observed at Mullaghmór where anticlinal and synclinal folding are evident, this gives the hill its characteristic shape. The syncline at Mullaghmór has dips of 10 – 15° with an east-northeast to west-southwest orientation. Much of the limestone that underlies the Park was once covered by further layers of limestone and capping of Namurian Shale. Glaciation and denudation following the Namurian phase progressively stripped off these deposits. The Burren lowlands and the Namurian Shale deposits were removed much earlier than in the Northwest region. Hence, erosional processes have acted over a much longer time span in the east and reduced the limestone to a low-lying plain which extends as far as the Slieve Aughty Mountains to the east. The Burren is one of the finest examples of a Glacio-Karst landscape in the world. At least two glacial advances are known in the Burren area. However, it is probably the effects of the last glaciation (the Midlandian) that are most in evidence in the National Park. It is thought that most of the Burren was overrun by ice during this glaciation. This is evident by the presence of fresh deposits of boulderclay at altitudes of just under 300 metres. The covering of ice is not likely to have been thick however, and some of the hills to the west may well have remained clear of ice. The ice that covered the Burren during this period eroded any remaining shales off the Park and helped to give the hills their rounded shape. The ice sheets had the effect of scraping off a lot of the loose material in the pavement areas but they were also responsible for depositing large heaps of loose material (boulder clay) in the forms of drumlins and moraines or low ridges. Examples of these can be seen on the eastern slopes of Mullaghmór. The glaciers also moved and deposited large boulders sometimes referred to as Erratics, these large limestone boulders can be seen on top of the limestone pavement in Rockforest, an area to the east of Mullaghmór. 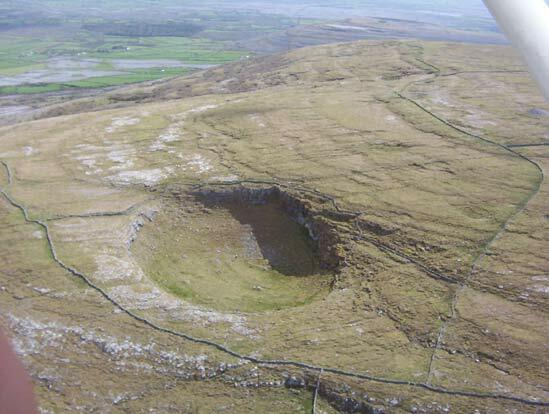 The effects of earlier solutional erosion (karstification) have been obliterated by the last ice age, so the karstification of the present day Burren has only been occurring since the last ice age approximately 10,000 years ago. The Burren Karst therefore is relatively modern compared with Karst from Eastern Europe. There is debate as to whether the glaciation removed all the soil from the limestone bedrock thus rendering the limestone exposed to karstification, or whether there was a thin layer of soil left which later became eroded exposing the limestone. Pollen analysis from the Burren would suggest that there was a thin layer of soil left after the ice age and that there was woodland present. 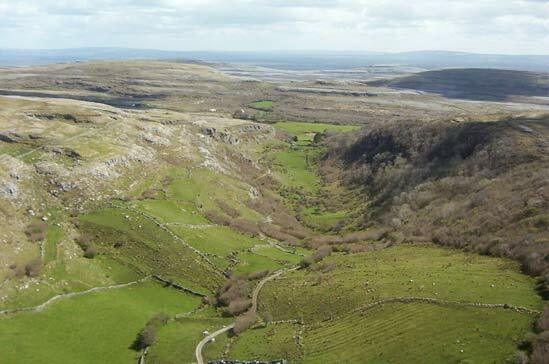 It is most likely however to be a combination of scouring of the landscape by the glaciers, soil erosion through runoff from melting glaciers and removal of woodland for farming that all combined together to remove the soil cover resulting in the exposed limestone pavement habitat we see today. Solutional processes have widened and deepened pre-existing vertical joints, or lines of weakness in the rock resulting in the formation of an extensive system of fissures (grykes) separated by flat pavement like slabs (clints). Many small solutional features, depressions and runnels, exist on these clints and within the grykes known as “Karren”. Due to rock karstification the drainage in the Burren is sub-terranean. This subterranean drainage creates a network of underground rivers, emerging occasionally as springs; the water disappears again to re emerge in Turloughs (disappearing lakes). There are a number of small closed depressions (dolines, poljes) within the Park, these are formed from the collapse of underground caverns or rivers. Within the Park, these are small. However, the Carran Depression, approximately 5 kilometres away, is the largest closed depression in Europe. Lough Gealáin, on the southwest of Mullaghmór, is a closed depression and Turlough, however it is a semi-permanent lake probably due to a deposition of impermeable soil during glaciation.